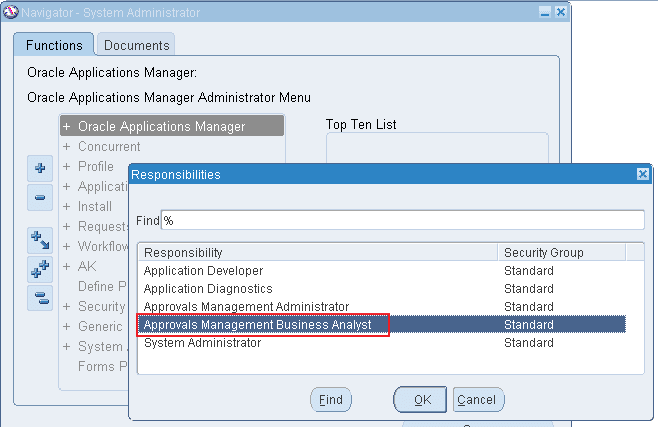 Accessing Approval Management Engine (AME) is not possible as we access other responsibility / functions in Oracle Applications like Order Management / Application Developer etc. AME is controlled by RBAC (Role Based Access Control). So in this case even you assign responsibility to the user but if user don't have the appropriate roles then you will not be able to access Approval Management functions. Let's assign the responsibility directly to user and see what happens. You will receive below error. 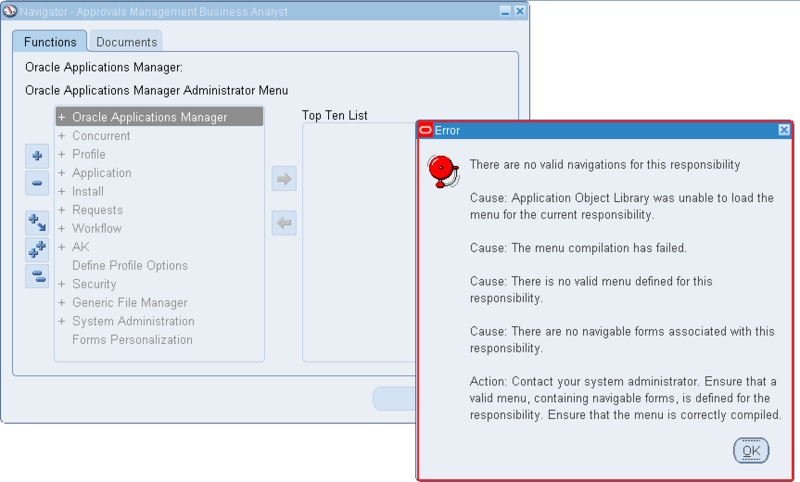 With the screen shots above we can see that even though the responsibility is assigned to user while trying to access it, It says There is no valid navigation for this responsibility. 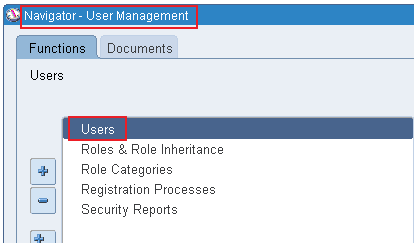 Assign the required roles to the user : This will give user access to use Approval Management functions. Grant access to respective AME transaction type : This will provide access to AME transaction type. If we don't perform this step then we will be able to access AME responsibility but will not be able to access any transaction types. We have following seeded roles provided by Oracle that can be used to access AME. Login with administrator / sysadmin user. Navigate to User Management -> User. Enter User Name and click on Go to find the user. Click on Assign Roles button. Search the role 'Approval Management Administrator' from LOV and select it. 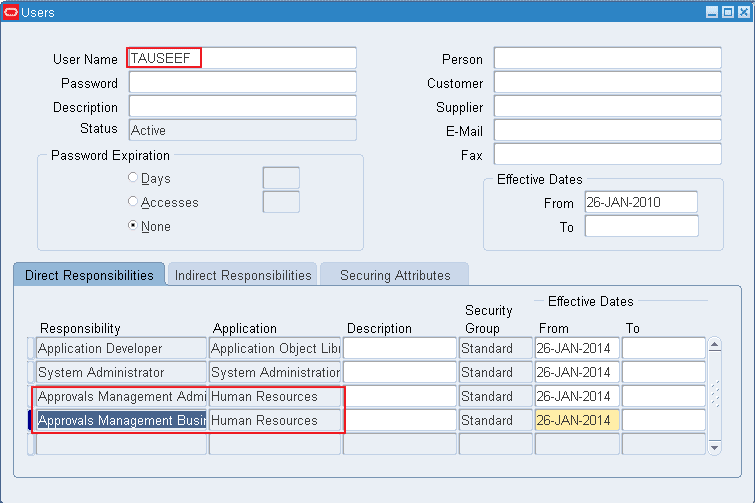 Based on the role chosen you will see number of functions added under users roles. Navigate to Functional Administrator -> Grants -> Create Grants. Enter effective from date and optionally effective to date. All Users : The grant will be applied to all the users and all users will be given same right / privileges that is part of this grant. Group Of Users : The grant will be applied to users those are part of the group. Specific User : Grant will be applicable of specific set of users that you select. I have opted for specific user. In addition to this you can also choose Operating Unit and Responsibility to make is more secure. Say you want to provide a user to AME access to US operating Unit only. In that case you can choose operating unit. If there is not such restriction required then leave it blank. In the Data Context Type select 'All Rows'. Select 'AME Transaction Types' as permission set and click Next to review the setup. I really appreciate information shared above. It’s of great help. If someone want to learn Online (Virtual) instructor lead live training in Oracle AME , kindly contact us http://www.maxmunus.com/contactMaxMunus Offer World Class Virtual Instructor led training on Oracle AME . We have industry expert trainer. We provide Training Material and Software Support. MaxMunus has successfully conducted 100000+ trainings in India, USA, UK, Australlia, Switzerland, Qatar, Saudi Arabia, Bangladesh, Bahrain and UAE etc. எண்ணிய முடிதல் வேண்டும், நல்லவே யெண்ணல் வேண்டும்; திண்ணிய நெஞ்சம் வேண்டும், தெளிந்த நல் லறிவு வேண்டும்; பண்ணிய பாவமெல்லாம் பரிதி முன் பனியே போல, நண்ணிய நின்மு னிங்கு நசித்திட வேண்டும் அன்னாய்! REGISTRATION OF OAF PAGE IN APPS. Picture Window theme. Theme images by JacobH. Powered by Blogger.